Arnold Palmer is generally regarded as one of the greatest players in the history of men's professional golf. Nicknamed "The King," he is one of golf's most popular stars and its most important trailblazer because he was the first star of the sport's television age, which began in the 1950s. This is an Arnold Palmer Collection, custom premium framed unautographed Laser Signature Engraved, oversize 30x32 piece. 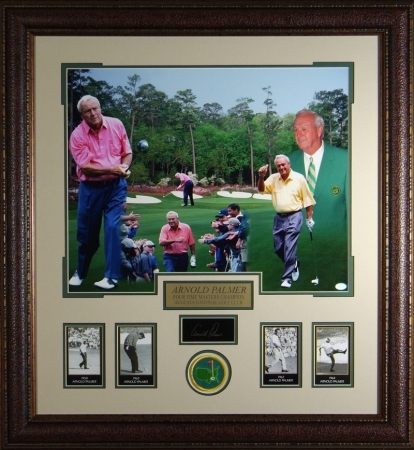 Unique collectible of one of the all time golf greats with multiple images and special engraved signature plate. This product was added to our catalog on Tuesday 12 December, 2006.